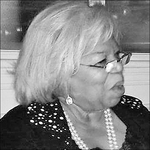 Obituary for Sylvia E. Rosario | McGuire Funeral Service, Inc.
Sylvia Eloine Rosario, M.Ed., LMFT was born in Boston, MA in 1936 to Elaine Dulcenia Gomes and Julius W. Snow and raised by her mother and stepfather, Joseph A. Firmin. She was a driven, ambitious, knowledgable and well-traveled woman. She married the late Joseph J. Rosario, Jr. (Ret. Captain), of New Bedford, MA and had daughters, Andrea (59), Dana (deceased) and Lita (56). In the 1970s she began a career as a college counselor and administrator at American International College. In 1979, she received an M.Ed from Antioch University and began working as a contract administrator for the Massachusetts Department of Education, Civil Rights Division. In 1984, she moved to Washington, DC and owned both a hair salon and antiques business. In 2008, at the age of 72, she found her true calling, clinical psychology, and ultimately became a licensed marriage and family therapist. In 2012, she was appointed by Mayor Gray as a Commissioner of the Board of Marriage and Family Therapy. In 2013, she was voted Vice Chair and in 2017, was reappointed by Mayor Bowser. In 2013, she was a collaborating investigator for the APA's DSM-5 Field Study. She is survived by her daughters; three grandchildren, Andre Dwayne (30), Andrew Keith (28) and Lita Angelle (23); beloved sisters, Marie and Paula; nephews and nieces; stepsons and many cousins and their beautiful children and grandchildren, all of whom she loved dearly. The interment will be at St. Michael Cemetery, Boston, MA.